WASHINGTON — Earlier this year, Yenimar Cortes confronted General John F. Kelly just before his confirmation hearing as secretary of Homeland Security to ask him if he planned to defend the Deferred Action for Childhood Arrivals program, or DACA. The Obama-era program allows certain undocumented young people brought to the United States as children to work in the country and be spared from deportation for a period of two years. Cortes is a “DACA-mented” individual. She came to the United States at age 2 with her parents, whom she says were seeking a better life and trying to escape poverty in Mexico. Yenimar Cortes came to the United States at age 2 with her parents from Mexico, wants the Trump Administration to know it has “my family and my life” in its hands. Seven months after that exchange, Cortes, 19, a political science major at Eastern Connecticut State University and recipient of a National Scholarship for undocumented students from thedream.us, is still seeking an answer from Kelly, who is now White House chief of staff. She sought that answer as one of several speakers Tuesday during a DACA rally that drew a diverse crowd of hundreds of DACA and immigration supporters — some from as far away as Florida — to Lafayette Square, just outside the White House. The protesters braved rain, beat drums and chanted pro-immigration slogans, such as: Up, up with immigration, down, down with deportation. Cortes, speaking from a platform, said: “Just like I looked back in January to John Kelly, I look at him today, because I know he’s going to hear our message. I know he’s going to see this video. Cortes then led the crowd to repeat after her: General John Kelly, do you want to deport me? In some ways, the answer to that question remains as unclear today as it was back when Cortes initially confronted Kelly. Which is why speaker after speaker Tuesday pointedly criticized the administration of President Donald J. Trump — who was away at Trump Tower in Manhattan — for not making a decision on DACA, yet deporting young Dreamers, such as Lizandro Claros Saravia, a 19-year-old undocumented student who was deported to his native El Salvador after he reported a soccer scholarship to ICE. The White House did not respond Tuesday to a Diverse inquiry on whether President Trump plans to maintain DACA. Jealous and U.S. Rep. Luis Gutierrez, D-Ill., were later arrested along with other protesters. 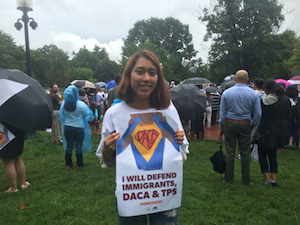 Jung Woo Kim, co-lead at the National Korean American Service & Education Consortium, or NAKASEC, and a DACA beneficiary, said his organization plans to protest outside the White House every evening until Sept. 5 — the deadline that a ten-state coalition — led by Republican Texas Attorney General Ken Paxton — has given the Trump administration to rescind DACA before they file a lawsuit against the program. “I’m doing this work because I’m a beneficiary of DACA. And I’m here to protect DACA because DACA changed my life and potentially changed the lives of more than 100,000 AA/PI (Asian American / Pacific Islander) community members,” Kim said. “Today is only the beginning. At times when hate politics put young people in danger, all we have is our faith that the public and the American people will support us. “If someone says, ‘Can you really save DACA?’ you know what I say, ‘Yes we can,’” Kim said as he led the crowd to put their fists in the air and chant the phrase — which hearkens back to the 2008 campaign of Barack Obama. Some speakers pointed out that when they initially asked President Obama to implement immigration reform through executive order, Obama responded in 2010 that “I’m president, I’m not king.” However, later — leading up to the 2012 elections — Obama implemented DACA via executive order. Now, just a couple of months past the five-year anniversary of DACA, supporters of DACA wonder if they can convince Trump to keep the program amid calls for him to end it. Cortes says supporting DACA is about taking action. Asked how she draws strength to vocally protest outside the White House when she could easily be deported if DACA is rescinded, Cortes said she draws strength from her fellow immigrants. She credited United We Dream with helping to cultivate courage and leadership.